The Different Modes of Use and Exercises of Rockets, both for Bombardment and for the Field. Four engraved plates (one with a caption a little cropped at outer margin). 20 pp., one blank leaf. 4to, attractive antique diced half-russia & marbled boards, spine gilt. London: J. Whiting, 1810. First edition. Congreve (1772-1828), is best known for creating the first rocket weapons system and initiating the modern processes of research and development in rocketry. His greatest interest was in "improving and perfecting the rocket as a military weapon. England subsequently adopted 'Congreve rockets,' which were used with great success against the French at Boulogne, Copenhagen, Leipzig, and elsewhere. They were copied by most European armies by 1830. "-D.S.B., III, p. 388. 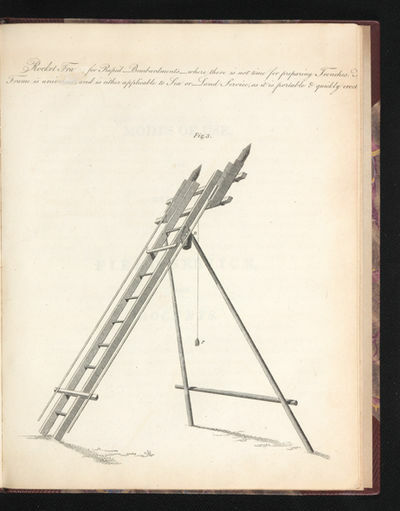 In this work, Congreve provides explicit instructions on how to launch rockets from the field for purposes of bombardment and against troops in the field. Fine copy and rare. .
A picturesque voyage to India by the way of China. Mit 50 kolor. Aquatinta-Tafeln. A Concise Account of the Origin and Progress of the Rocket System. With a View of the apparent Advantages both as to the Effect produced, and comparative Saving of Expence, arising from the peculiar Facilities of Application which it possesses, as well for Naval as Military Purposes. 3 p.l., 32,  pp. 4to, attractive antique diced half-russia & marbled boards, spine gilt. London: J. Whiting, 1810. Second edition, enlarged (1st ed. : 1807). Congreve (1772-1828), is best known for creating the first rocket weapons system and initiating the modern processes of research and development in rocketry. His greatest interest was in "improving and perfecting the rocket as a military weapon. England subsequently adopted 'Congreve rockets,' which were used with great success against the French at Boulogne, Copenhagen, Leipzig, and elsewhere. They were copied by most European armies by 1830. "-D.S.B., III, p. 388. In the present work, Congreve discusses the possibilities which rockets had for military operations. He does not describe the actual rocket -- this secret he guarded zealously. 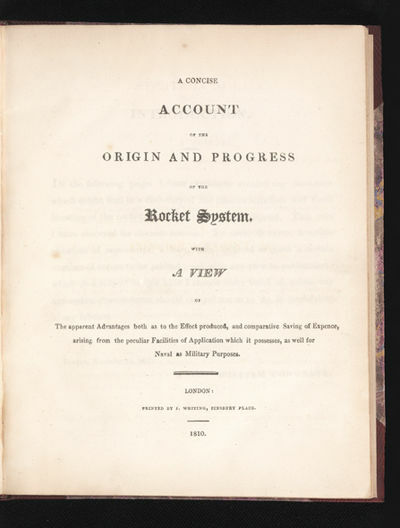 This edition contains for the first time a "Postscript" dated 10 April 1810 which prints various favorable accounts by military men who had witnessed the rockets used in Belgium. Fine copy and rare. .
Gotische Kirche hinter Bäumen. Federlithographie. Elementary Botanical Plates Illustrative of the Science of Botany. Leipsic: Breitkopf & HÃ¤rtel [PN 1609], 1810. First German edition, second issue. LVB WV pp. 465-67. Del Mar P2. Hoboken Vol. 2 No. 333 (citing this edition as the first). The first edition was published in September 1810 by Clementi & Co. in London, shortly followed by the first Breitkopf edition in November. The so-called Harp Quartet was probably first performed at the home of Prince Lobkowitz in Vienna in November 1809.. Folio. Sewn. Housed in a modern archival cloth box. Violino Primo: 1f. (title), 3-11, [i] (blank) pp. Violino Secondo: 7, [i] (blank) pp. 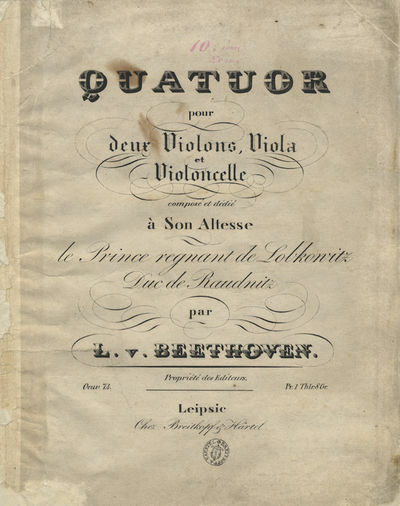 Viola: 7, [i] (blank) pp. Violoncello: 7, [i] (blank) pp. Engraved. Publisher's handstamp to lower margin of title. Professional repairs to inner margins of Violin I. Minor performance marks and fingerings in pencil and red crayon. Some soiling and staining. A good copy overall. 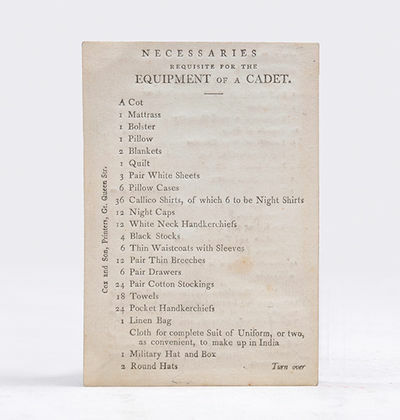 Necessaries required for the Equipment of a Cadet. London: Cox and Son, Printers [for the Honourable East India Company],, c.1810. Small (125 Ã— 86 mm) letterpress aide memoire on light card stock, printed both sides. Very good indeed. A remarkable survival, no other copy traced institutionally or commercially. Fascinating "shopping list" of essentials for a cadet shipping out for India. In Charles James's authoritative Regimental Companion of 1811, this card is specifically referred to in the section setting out "Preparatory Instructions to Persons who may be nominated Cadets in the Service of the Honorable East-India Company": "Upon the Cadet being approved by the Committee of Shipping he will be furnished with a card of necessaries for his equipment, a list of the Shipping, and the court's regulations as to the sums to be paid for accommodation on board ship" (p.103); and a slightly variant list of these "necessaries" is provided under the heading of "List of Necessaries that are absolutely required for the Equipment of a Cadet going out to India" (pp.105-6). The extent of the list gives a good sense of just how large the two trunks included on the list must have been, and James stresses that "the cadet's baggage is limited to a chest of necessaries, a trunk of necessaries, a liquor case, a hamper of wine, a cot and bedding" (p.105): "Â… 36 Callico Shirts, of which 6 to be Night Shirts, 12 Night Caps, 12 White Neck Handkerchiefs Â… 12 Pair Thin Breeches Â… 24 Pair Cotton Stockings Â… Cloth for complete Suit of Uniform, or two, as convenient, to make up in India Â… 12 Pounds of Soap, 6 Pounds of Wax Candles, 1 Flat Candlestick, &c., 1 Small Looking Glass Â… 14 pounds of Sugar in a Cannister Â…". The printer Edward Cox's workshop was located on Great Queen Street between 1790-1824, his son joined as a partner in 1799, and the firm became associated with East India House in 1809, which would be just about the time that this aide memoire was produced (see Todd's Directory of Printers, p.48). An official document of the East India Company, A part of the formal induction process, this pocket-sized card would have been presented to every one of the thousands of HEIC cadets who embarked for India - in 1806 the combined European strength of the three presidential armies was recorded as 24,500 (Imperial Gazetteer of India vol. IV 1907, p. 335) - yet this appears to be the only recorded survival. Attractive, and highly evocative. Karyatide, Mädchen nach links mit Schriftbändern, nach Raffael. - Kreidelithographie 1810-1816. 50,4:36,6 cm. Literatur: Dussler 3, Winkler 502.15.- Das sechste Blatt der 31. Lieferung der Oeuvres Lithographiques (vgl. Piloty).- In der unteren rechten Ecke Einriß. Squire & Warwick for John Murray, 1810. Hardcover. Acceptable. 1810. 419 pages. No dust jacket. Brown, half leather bound with gilt lettering and marbled boards. Severely hinge cracked with noticeable foxing, tanning and handling marks. Intermittent dog-eared and missing corners. Noticeable rubbing and scuffing along spine with loss of leather and splitting. Noticeable bumping, rubbing and scuffing to spine ends and to corners with noticeable rubbing, scuffing and wear along edges and over surfaces. Leather is missing at corners. Black marking at front. coâ?? tipi di Luigi Mussi 1810 - 1811 4to (cm. 29), 11 Voll., XLIX(I) - 344(2) pp. con una tav. f.t. ; 391(3) pp. ; 377(1) pp. ; 364 pp. ; 446 pp. ; 407(1) pp. ; 405(3) pp. ; 433(3) pp. ; 434(2) pp. ; 445(3) pp. ; 261(1) pp. Assente il ritratto. Legature coeve in mz. pelle con angoli. Fili, fregi e titoli in oro su tre tasselli in pelle al ds. Alcuni volumi con il ds. sapientemente restaurato, altri con piccole fenditure alle cerniere, ma nel complesso esemplare in buono stato di conservazione. Sulla carta che precede il frontis. del primo volume lâ? ?Editore e il Tipografo attestano con propria firma autografa che lâ? ?edizione Ã¨ formata da 200 esemplari in carta real velina bianca, 8 esemplari in carta real velina turchina e 12 in carta ordinaria (spera). Il ns. esemplare Ã¨ il n. 6 dei 12 in carta spera, appartenuto al Sig. Raffaello Luigi Formiggini di Milano. ESSAYS ON PHYSIOGNOMY, Designed to Promote the Knowledge and the Love of Mankind. Three Folios bound in Five. Panorama van Arnhem - Julius Gottheil, 1854. "Panorama van Arnhem genomen van het Hòtel de Belle-Vue' Lithografie vervaardigd door G.J. Thieme naar een tekening van Julius Gottheil (1810-1864), uitgegeven rond 1854 door P. Klinkenberg. Later met de hand gekleurd. Afm. : 37 x 73 cm.We zien Arnhem vanaf het dak van Hotel Bellevue aan de Utrechtseweg. Het hotel brandde af in 1908, tegenwoordig biedt een kantoorgebouw met diezelfde naam vanaf die plek uitzicht op stad.Zes jaar nadat de eerste spoorlijn in Nederland, van Amsterdam naar Haarlem in 1839, was geopend, bereikte de ijzeren spoorweg Arnhem. De Rhijnspoorweg verbond Arnhem via Utrecht met de hoofdstad van ons land. Daarmee was een snelle, directe verbinding tussen Arnhem en het westen van het land gerealiseerd. De opening van de spoorlijn op 14 mei 1845, waarvoor koning Willem II zich wegens 'keelpijn" had afgemeld, ging gepaard met de ingebruikname van een stationsgebouw. Het gebouw had terrassen op de eerste verdieping met uitzicht op Sonsbeek en de Betuwe. Het gebouw was al snel te klein en in 1869 werd een robuust bakstenen pand het nieuwe onderkomen.De stoomtrein stelde mensen uit het westen in staat snel het groene en villarijke Arnhem te bereiken. Rechts naast de spoorlijn zijn grafzerken te zien van de voormalige Joodse begraafplaats 'De Valk" (geruimd in 1966). Schuin daarachter de hooiopslag voor de paarden van de soldaten van de Willemskazerne. De rokende schoorsteen naast molen 'De Harmonie" (gesloopt in 1855) is van de metaalgieterij van Willem Thomassen.In het midden van de stad zien we de Sint-Eusebiuskerk en op de achtergrond de Walburgiskerk. Op de fundamenten van de stadsmuur werden vanaf 1829 huizen gebouwd. Het zijn in de eerste jaren vooral Arnhemse handelaars en bankiers die nieuwe huizen laten bouwen op geslechte vestingwerken. Zij beschikten over financiële armslag door de groei van de overslaghandel over de Rijn met Duitsland en de aanleg van verharde rijksstraatwegen naar het Veluwse achterland. Achter hun stadspaleizen stonden nog de armoedigste krotwoningen stonden, verborgen 'zoodat het oog van de vreemdeling niet langer onaangenaam getroffen worde".Het spoornet rond Arnhem groeide snel. In 1856 werd de verlenging naar Emmerik, via Zevenaar, geopend en weer negen jaar later vond de opening plaats van de spoorweg naar Zutphen. In 1879 bereikt de spoorlijn ook Nijmegen.Prijs: â‚¬ 3.450,- (incl. lijst). [Ritson, Joseph, and Francis Douce, or possibly Joseph Haslewood]. London: Printed for R. Triphook, by Harding and Wright, 1810. Small slim 8vo, (2), 46 pp. Full period-style green morocco gilt (by Dusel), a very good, well-margined copy. 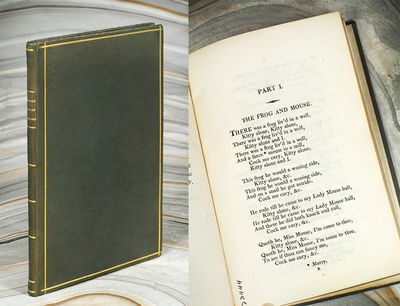 First Complete Collected Edition "A collection of 134 rhymes divided into four parts. 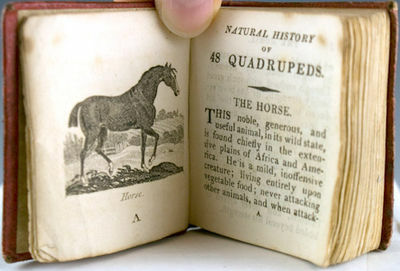 The editor of the first two parts, which were published in 1784, was the literary antiquarian Joseph Ritson. Parts III and IV, here first published, contain many additional rhymes, collected by Francis Douce and others (possibly including Joesph Haslewood). The book is curious in that it is unillustrated and apparently for adults. "- Opie 30. Among the early nursery rhymes that appear here for the first time are Little Bo-peep, Humpty Dumpty, I love sixpence, a jolly, jolly sixpence, etc. The compleat angler, being a discourse of Fish and Fishing. For more info about this item, see our RARE FISH BOOKS site. Album mit 12 kolorierten Kupfertafeln - jeweils verschiedene Tiere zeigend. Um 1810. Gegend bey Langenbrand im Murgthale. - Kupferstich v. Primavesi n. C. Kuntz, um 1810, 17,6 x 26 Nicht bei Schefold. - Blick ins Murgtals, rechts auf dem Weg ein Wanderer und 2 diskutierende Personen. An Englishman's descriptive account of Dublin, and the road from Bangor ferry to Holy Head, also the road from Dublin, by Belfast, to Donaghadee, and from Portpat[r]ick to Newcastle upon Tyne, by way of Dumfries, Carlisle, and Gillsland. \"Ansicht von München, und des von dem Verfasser der theoretisch-practischen Wasserbaukunst, Ritter von Wiebeking, in der Isar erbauten Durchlaß Wehres\". Gesamtansicht über Isar mit der 1815 erbauten steinernen Brücke. Die Brunnen zwischen Weichselboden u. Wildalpen". Federzeichnung über Bleistift auf Papier. London: Darton, Harvey, & Darton and J. Harris, 1810. Mills, Alfred. 96 pp. First edition. With 48 engraved full-page plates. Scattered light internal spotting and wear, else a nearly fine copy in publisher's full red morocco with gilt-stamped spine. A scarce Mills title. (2 11/16 by 2 3/8; 68x61mm.). (Bromer/Edison, p. 140-141; Darton G651.1; Osborne p.207; Spielmann 365; Welsh 4993). Plans des plus béaux jardins pittoresques de France, d'Angleterre et d'Allemagne, et des edifices, monumens, fabriques, etc. +++ Plans of the most beautiful picturesque gardens in France, England and Germany and of the edifices, monuments, fabrics, etc. which contribute to their embellishment, of every kind of architecture, such as Chinese, Egyptian, English, Arabian, Moorish, etc. +++ Plaene der schoensten und malerischten Gaerten Franckreichs, Englands, und Deutschlands , etc. Deuxieme Partie / Vol. 2 only (of 2). / Zweiter Teil. N.p. [London], 1810. Wove paper watermarked "J. Ruse 1804". 8vo. Blank account book bound in vellum, stamped in blind on spine "Williams's 65 [--[ Patent," textblock sewn onto metal tabs, which have since oxidized and deteriorated, staining and damaging the spine, covers bowed, text is clean, written in a clear, legible hand. Wove paper watermarked "J. Ruse 1804". 8vo. An unrecorded fair copy of an early draft of Irish author Eaton Stannard Barrett's best known poetic work, published in 1810, and then re-written almost entirely for a second edition published in 1818. "In 1810 Barrett published Woman and other Poems. Written in the manner of Pope, 'Woman, a Poem' was, according to Reiman in his 1979 edition of it, 'more popular during Barrett's lifetime than any single work by a major or secondary poet then living, including Scott or Byron.' The volume ran into several editions, being reprinted as late as 1841" (ODNB). Barrett is perhaps best remembered today for his mocking take-off of the Gothic novel, The Heroine (London, 1813). A comparison between the present manuscript and the published first edition shows substantial differences and similarities. Barrett altered the overall structure of the poem by breaking what is here a continuous thread into four parts. The major textural differences: the published version has at least 52 more lines than the manuscript, and in addition there are 20 lines which have been substantially re-written. There are also a further (approx.) 340 words that have been changed. Conversely, the manuscript includes 12 lines that have been deleted from the published version. Höhenleitnerische Kunsthandlung, Kohlmarkt Nº 1218, Wien 1810 - Gouache und Aquarell auf Kupferstich-Raster. 129x183 mm. Schloß mit Wassergraben, auf der Brücke ein Mann mit beladener Schubkarre. Oben rechts: "Nº 30". Von der früheren Besitzerin mit Tinte bezeichnet: L v P (Luise von Palombini). Auf der Rückseite ist der damalige Preis angegeben: "f 3.10" Sehr gute Erhaltung. Die Höhenleitnerische Kunsthandlung wurde 1807 von Heinrich Friedrich Müller übernommen und seit 1811 von ihm unter eigenem Namen fortgeführt (Sigmar Radau). Luise von Palombini (1807-1832), das älteste von 5 Kindern des italienischen Generals Giuseppe Federico oder Joseph Friedrich [von] Palombini (1774-1850). Dieser kämpft sich auf Seite der Republikaner in Italien hoch, dient im italienischen Korps der Grande Armée im Krieg gegen Preussen und Schweden (Belagerung von Stralsund 1807), später als Divisionsgeneral in Spanien, und kommt letzlich nach Italien zurück (1813). Als das napoleonische Reich zusammenbricht, nimmt er das Angebot an, in die österreichische Armee zu überwechseln und bekommt den Rang eines Feldmarschalleutnants. Er verbringt dann seinen Lebensabend auf einem Gut seiner Frau Caroline, einer Tochter des polnischen Generals und Freiheitskämpfers Jan Henryk Dombrowski, in Grochwitz bei Herzberg/Elster in Sachsen, was die deutsche Herkunft unserer Stickereivorlagen erklären könnte. Gewicht: 0,01 kg. Shipping: See our shipping terms. Versand: Siehe unsere Versandbedingungen. ENGLISH SUMMARY: Castle with moat, on the bridge a man with a loaded barrow. Gouache and watercolor on a copper-engraved raster, numbered "Nº 30". Inscribed by the former owner with her initials "L v P". Luise von Palombini (1807-1832), the oldest of 5 children of the Italian general Giuseppe Federico, or Joseph Friedrich [von] Palombini (1774-1850), who first fights in Italy on the side of the Republicans, and later serves in the Italian corps of the Grande Armée in the war against Prussia and Sweden (siege of Stralsund 1807). He then becomes a divisional in Spain and eventually returns to Italy in 1813. When the Napoleonic Empire crumbles away in 1814, he accepts the offer to go over to the Austrian army and obtains the rank of a field marshal lieutenant. He spends the rest of his life on an estate of his wife Caroline, a daughter of the Polish general and fighter for the freedom of Poland Jan Henryk Dombrowski, in Grochwitz near Herzberg/Elster in Saxony, which might well explain the German origin of our embroidery patterns. The Höhenleitner art shop was taken over 1807 by Heinrich Friedrich Müller who ran the business under his own name from 1811 on (Sigmar Radau). Very good conservation. London: Pr. by Richard Edwards for T. Hamilton et al. 4to (27.5 cm, 10.85"). 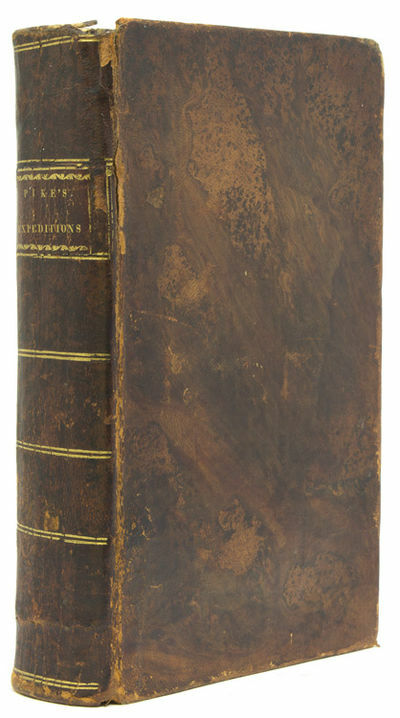 Frontis., , lxxii, , 275,  pp.. 1810 First edition of Wycliffe's English translation as revised by John Purvey, with new preliminary material by the Rev. Henry Hervey Baber. Baber (1775–1869) was a librarian first at the Bodleian and then at the British Museum, and a Fellow of the Royal Society as well as an assistant preacher at Lincoln's Inn. The text is printed in double columns; it preserves the original 14th-century spellings and is decorated with ornamental capitals. The colophon incorporates the printing information of an earlier edition, sans Baber's contributions: "Printed by John March . . . MDCCXXXI . . . reprinted by Richard Edwards . . . MDCCCIX." Provenance: Front free endpaper with bookplate of John Howell and his small ticket to back free endpaper; early ownership inscription of Alexander B. Stewart to first page of "Memoirs"; later in the collections of the Pacific School of Religion (properly released). 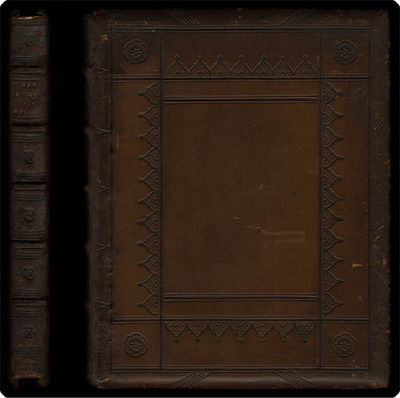 Binding: 19th-century medievally inspired calf, covers framed and panelled in blind with blind rolls and blind-tooled corner fleurons; spine with raised bands, gilt-stamped title, and blind-stamped compartment decorations. All edges gilt. 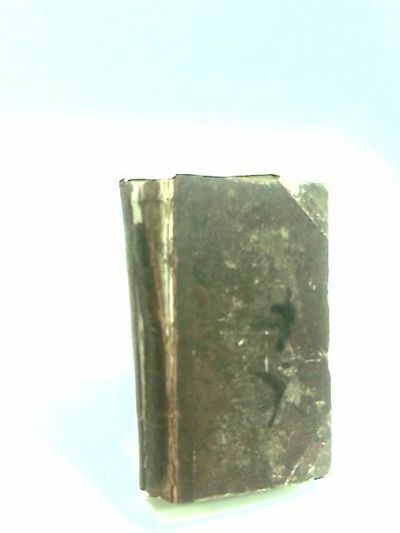 Binding as above, edges rubbed, sides with small scuffs, joints repaired using long-fibre tissue toned to match binding; spine extremities chipped. Frontispiece with lower and inner portions waterstained (not into image), with some offsetting to title-page; title-page with ownership inscription effaced and other indicia as above. Occasional light foxing, with some leaves more noticeably age-toned than others; one page with line of discoloration along upper edge. => A nice example of early 19th-century engagement with medieval Biblical scholarship and style. St. Louis, Louisiana Territory (i.e. Missouri): Printed by Joseph Charless, 1810. 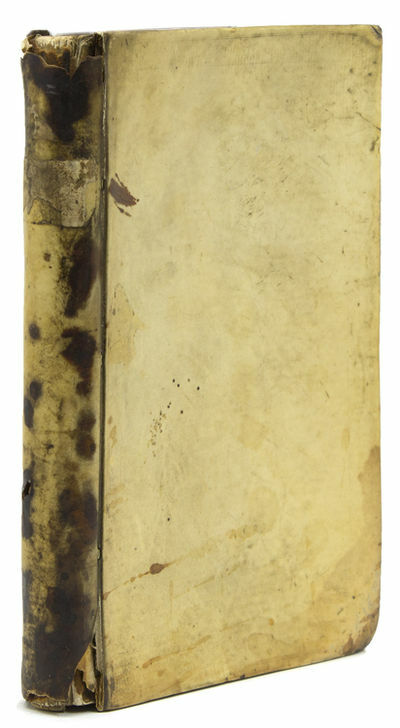 Expertly bound to style in period tree calf and marbled boards, spine gilt, morocco label. Very good. One of the earliest Missouri, and therefore Trans- Mississippi, imprints. Following the Louisiana Purchase, Louisiana Territory was divided into two districts, with the upper district becoming Missouri Territory in 1812. 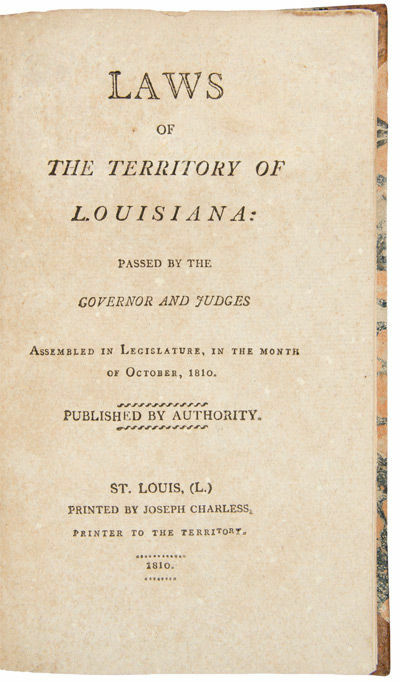 This work is a supplement and revision to the first Laws of Louisiana Territory, printed at St. Louis by Joseph Charless in 1808. Charless was the first printer in Missouri. An Irish emigrÃ©, he fled to Philadelphia and worked for Mathew Carey in Philadelphia before relocating to Louisville and thence to St. Louis in the summer of 1808. Upon his arrival, he was made the official printer to the territory. An exceedingly scarce item; Lathrop Harper, sold an example in 1941 for $450. Only a handful of copies listed in OCLC. SHAW & SHOEMAKER 20593. AII (MISSOURI) 4. Freundschaft und Liebe" (Rückentitel). Stammbuchkassette. Hamburgo: Giovanni Augusto Böhme [without PN], [ca. 1810]. Oblong folio. Contemporary half vellum with green marbled boards, decorative white cut paper label in the shape of a goblet with manuscript titling to upper. 1f. (pictorial title with vignette depicting a scene from the opera engraved by Wolf), [i] (blank), [i] (cast list and contents, grouped in four acts, in Italian but with German incipits only), 3-205 pp. Engraved. Watermark: "FCD" and fleur de lys with crown. Paper with a greenish cast. Printed text underlay in Italian and German; stage directions in German only. Musical numbers reordered and grouped in four acts. Boards slightly worn; rubbed and bumped at edges and corners; upper hinge split. Repair to small tear to lower outer corner of first page of music; one leaf dampstained. Sharp added in pencil to p. 183. A very good copy overall. / A later edition. Rare. Köchel 6, p. 598. Hoboken 11, 345 and plate 181 (same watermark as present copy). Hamburg, Öffentliche Bücherhallen (municipal library). RISM M4508. Böhme published several editions of the piano-vocal score; Köchel does not distinguish among them. RISM M4509 is not credited to Neefe; the copy at the Royal Danish Library in Copenhagen carries plate number 42. RISM M4510 (including Hirsch IV, 131) and the copy at the Staats- und Stadtbibliothek Augsburg are also different: the credit to Neefe is lacking; the word "Pianoforte" is misspelled "Pianoforto"; the contents are arranged in the original two acts (as suggested by the title) rather than the spurious four, and one number, the duet of Zerlina and Don Ottavio, "Ach Schätzchen, lass mich laufen" (i.e., "Restate qua"; composed later) is added; also, Hirsch cites plate number 300; not in the Augsburg copy, and a pagination running to 209. The pictorial title is basically the same as that of the first edition of the full score by Breitkopf & Härtel (1801); only the line crediting the reduction and the imprint are new. \"Vue prise près du Moulin dit Buschmühle dans la Vallée de Plauen près de Dresde\". Blick auf die Buschmühle (bzw. Bienermühle oder Schweizermühle) rechts, auf dem Weg davor Kutsche, Reiter und mehrere Ausflügler. \"Pont de Munic à construire sur le torrent de l`Isar\". Ansicht der Ludwigsbrücke mit hübscher Personenstaffage, im Hintergrund Türme der Frauen- und Peterskirche. Unter der Ansicht (16 x 72 cm) 12 Konstruktionsdetails, Aufrisse und Profile der Brücke. MÜNCHEN. "Pont de Munic à construire sur le torrent de l'Isar". Ansicht der Ludwigsbrücke mit hübscher Personenstaffage, im Hintergrund Türme der Frauen- und Peterskirche. Unter der Ansicht (16 x 72 cm) 12 Konstruktionsdetails, Aufrisse und Profile der Brücke. - Kupferstich von F.W. Bollinger aus K.F. Wiebeking, um 1810, 53 x 72 cm. Lentner 1484; Slg. Proebst 521. - Am oberen Rand restaurierte Einrisse und Randergänzungen. Schöner, kräftiger Abdruck. London Blackfriars Bridge, c. 1810-1820. VIEW OF LONDON WITH BLACKFRIARS BRIDGE"Vue de la Ville de Londres"' Magnificent aquatint engraving by Joseph Schütz after Friedrich Ferdinand Runk, published c. 1810-1820 by Artaria & Comp. of Vienna. Original hand colouring. Size: approx. 45 x 69 cm. Framed.London as seen from the Southwark side of Blackfriars Bridge, with St. Paul"s Cathedral dominating the skyline in the background.Particularly interesting is the staffage of the scene. On the bridge we see pedestrians, soldiers on foot and on horseback, various types of carriages, a dray, a coach, a cart with logs. Also there is quite some traffic on the river Thames.Ferdinand Runk (1764 Freiburg im Breisgau - 1834 Vienna) was a landscape painter and engraver graduated from the Vienna Art Academy.Price: â‚¬ 8.000,-. St. Jago de la Vega, 1810. Several tears along folds, edge nicks. Light dust soiling in upper margin of first page. Overall condition is good. 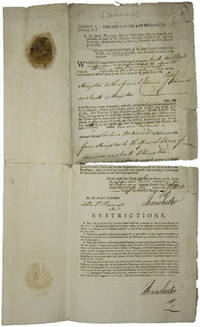 This document is a trading license issued by the governor of Jamaica to the Spanish brig, General CastaÃ±os, commanded by Antonio Herrera. The license is specifically for trade "from the port of Kingston to the Spanish Colonies of America and back to Kingston." It is specifically designed to show British warships who might try to take the vessel as a prize. Further restrictions are printed on the integral second leaf. The document is twice signed in manuscript: "Manchester." An interesting trade document printed in Jamaica.